Are you looking to take better photos? Check out the best iphone tripods to buy in 2018.There are so many little tips and tricks that go into taking good photos. When you’re ready to step up your mobile photography game, consider investing in some of the best iPhone tripods. But with so many available, how do you know which one to choose? Lucky for you, we’re here to make your search a little easier. Not everyone can afford the camera of their dreams. Sometimes, you’ve got to just keep saving. The nest best thing is to use your iPhone. The iPhone 8, 8S and X take surprisingly crisp, clear images. By investing in one of the best iPhone tripods, you’re guaranteed to take better pictures. Now, when you’re traveling, you don’t have to stop and ask people to take a snap of you in front of the Big Ben. When you’re on the beach, you don’t have to worry about that awkward arm-extended selfie. Your photos will look more professional. 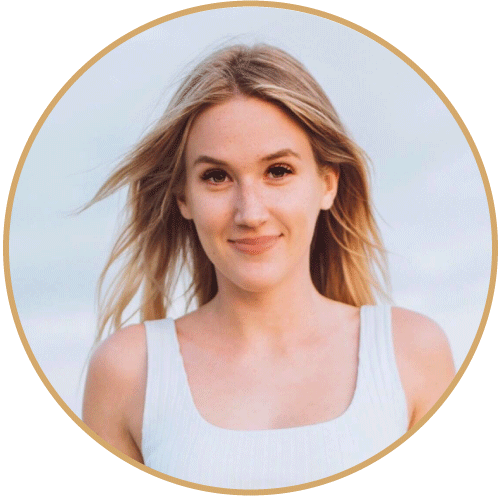 If you want to build up your personal brand on social media, start by stepping up your photo game. By editing your photos, it can be hard to tell the difference between ones taken on your smartphone or with an entry-level DSLR. Using software or editing apps like Adobe Lightroom makes all the difference too. When you’re looking at the best iPhone tripods, how do you choose which one to get? Well, you’ve got to ask yourself several questions. While most of these items are relatively affordable, you should first decide how much you want to spend. Next, make sure the tripod you are looking at is compatible with your iPhone or other smartphone device. Other factors like wireless photo taking capacity, flexibility, and tripod height should come into play. Take your mobile photography to the next level with this flexible iPhone tripod. Flexible wrappable joints help to secure your phone to objects and allow for adaptable camera positioning for precise control in photo or video composition. You’ll even have stability on flat or uneven surfaces. Rubber foot grips stabilize smartphone for convenient media consumption and crisp photos.The rubber pads secure phone in place, even when turned sideways. Thanks to a premium clamping mount, you can hold your smartphone in any place. See the world from a different point of view. 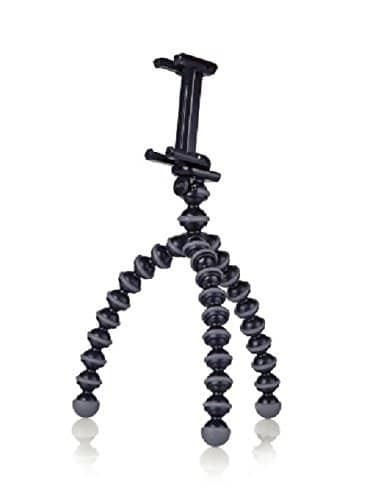 Take your phone anywhere and capture any angle with the GripTight GorillaPod Stand by JOBY. The lightweight, compact design is easy to travel with, while giving you a super-secure mount and grip. The octopus-style tripod for smartphones can rotate 90 degrees so you can shoot an image or video, and quickly review what you just captured. The GripTight is made to unleash your creativity so you can get the best shot, at the best angle. The easy to maneuver and adjustable the TPE legs and rubberized foot grips onto almost surface, and the 150-degree tilt means you can get the shots you want. Made out of durable, yet lightweight plastic and acrylic, the JOBY GripTight GorillaPod Stand will never let your smartphone slip out of its grasp. It’s designed to be compatible with any cell phone, with or without a case, including iPhone 6, iPhone 7, iPhone 8, Nokia Galaxies, and Nokia Lumia’s. Whether you’re creating, viewing, or sharing, you will get a better experience with GripTight. Enhance your proficiency with your favorite apps. It's one of the best iPhone tripods on the market. Reliable Grip: The JOBY GripTight GorillaPod Stand has a secure hold for phones with or without a case, for crystal clear images. The rubber foot grips and wrappable legs ensure your phone can be mounted to any surfaces, without a slip of the grip. Capture Superior Perspectives: Look at life from a different point of view with adjustable locking screw you can change the angle, as you easily maneuver your phone. The legs wrap securely around any surface as your phone stays securely in place, even on its side. Durable Design: With thoughtful engineering, the GripTight GorillaPod Stand is lightweight, but extremely strong. Made of sturdy ABS plastic, TPE, and stainless steel, it is made for the wear and tear of everyday life, or the rigor of every adventure. Clear Images: Capture crisper photos, smoother videos, and optimal media consumption on your smartphone when using the GripTight GorillaPod Stand. With a ¼”-20 thread standard tripod mount, you can easily use it with other JOBY products. Looking for the best iPhone tripods? You've found one here. 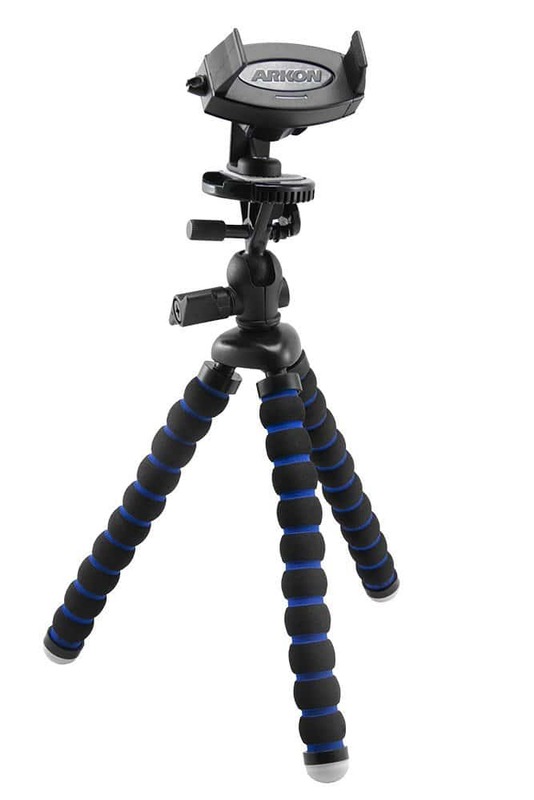 This lightweight travel tripod; compact and stylish, it will get you farther. Experiment with different ways to see the world. 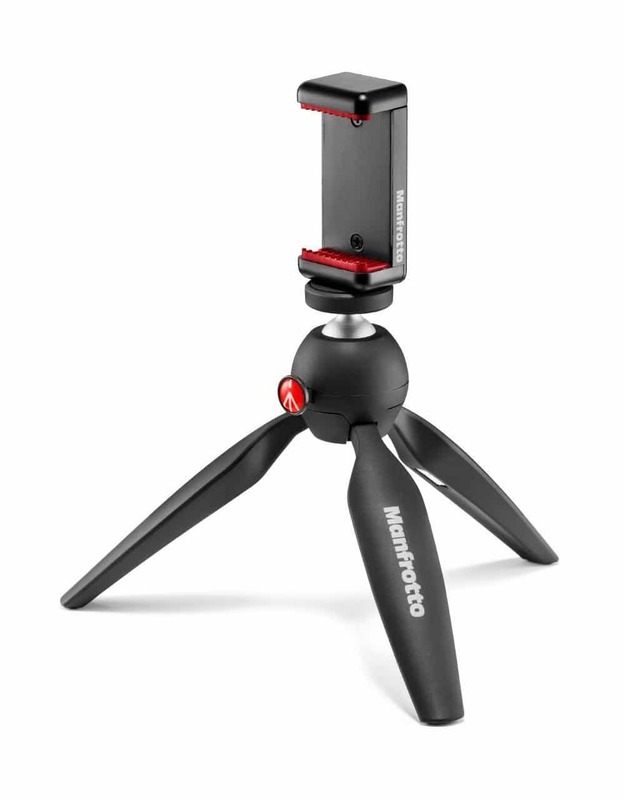 The Fotopro iPhone Tripod is small enough to take on your travels. This three-head allows both vertical shooting and horizontal for making unique photos. It’s also height adjustable. Eight-section legs give you the height you need, expanding from 11 inches to 39.5 inches and ultimate versatility. Last but not least, with bluetooth remote control, you can shoot from a distance. Quick-Open Design: Tripod legs are designed with Sticking Point Type instead of Flip Leg Locks.This is for quick open purpose,when you are shooting for some beautiful moments,timing is the key. You only get one shot,so don't miss it. This style is small but beautiful. Versatile and lightweight, it offers a gorgeous Italian style. This is one of the best iPhone tripods on the market. It’s flexible, creative, and compact, the perfect choice for sports enthusiasts, travel photographers, and videographers who want to capture life in motion. Adaptable and handy, it’s the perfect partner for your smartphone if you’re into taking awesome spontaneous pictures every day. Stretch the bounds of your creativity with this fun little travel accessory. You can also use it as a stable base thanks to the self-standing bracket on its back. 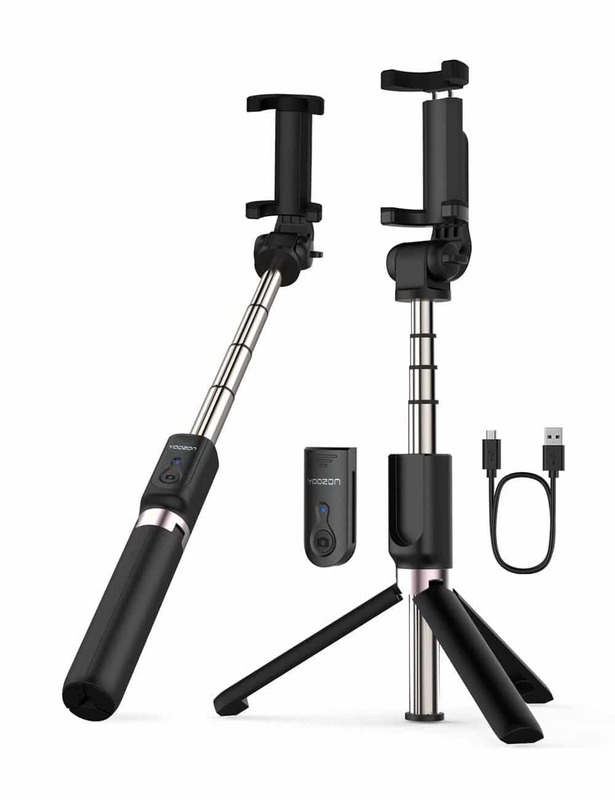 Each selfie stick you receive,is produced using 42 working procedures and it is made of top quality materials such as space aluminum alloy,anti-slip rubber tripod. Every individual part of each selfie stick made, has to be checked in accordance with ISO standards before shipping. An essential item to take on your holidays or days out -YOOZON multipurpose selfie stick, lets your memories stay in that moment. It's definitely one of the best iPhone tripods. Lightweight and Portable: Yep, screwing a monopod selfie stick with a heavy tripod, is a pain. Our lightweight foldable selfie stick was designed to eliminate this to make a ordinary Selfie Stick lighter but more functional. Integrated Tripod: Gently slide the wireless remote from stick.It takes 3 seconds to make the TRIPOD appear just simply unfold the bottom part of the selfie stick. Ingenious design which makes the tripod open or close in one step. Fantastic way to start your selfie happiness. Flexible: Extendable length from 7.9 inches to 26.6 inches so you can choose your desired length.Compact pocket size design, which is easy to carry. 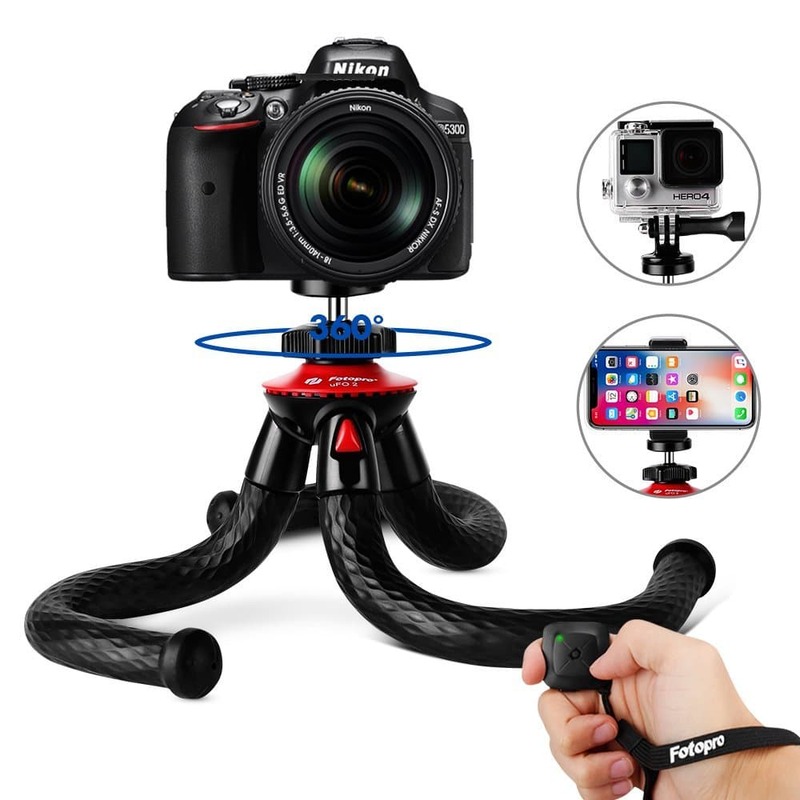 With 360°rotation, you simply twist the cradle head or phone holder to take photos, video call or live broadcasting , to meet your different needs, or situation. Bluetooth: Yes. Just charge the bluetooth remote shutter via micro USB. Built-in 65mAh lithium battery which makes the charge last longer. The range of the wireless connection can be up to 10 meters and widely compatible with most Apple/Android smartphones like iPhone 8/7/6 series, Samsung Galaxy series, etc. 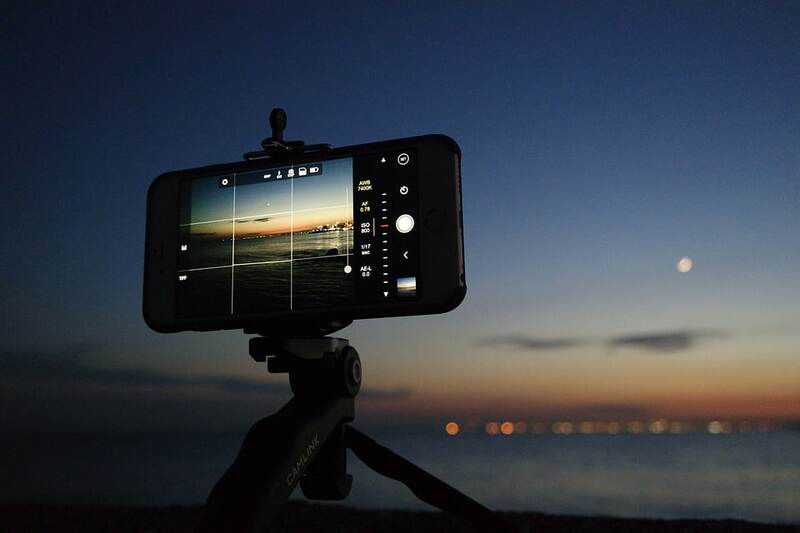 Enjoy one of the best iPhone tripods on the market. Your photos will never look better. This little travel accessory gives you the best angles and versatility. The flexible tripod Legs can be curved randomly for all kinds of places by attach anywhere for better creativity. An adjustable ball head allows the smartphone to adjust to the proper angle. We love how durable and robust it is. Made from a high-quality material, it offers a waterproof and corrosion resistant exterior. Even when used underwater or wet conditions, this tripod maintains good performance and longevity. You also don’t need to be afraid of breaking it. On the contrary, bend out the shape you want. The strong flexible legs can easily wrap around a tree branch, fence, bench, bicycle, allowing you to capture different angles on your trip. Here’s our favorite part. There’s also no need download any annoying application for using the Bluetooth remote product. You can easily connect to it from your phone. You can start or stop recording videos as well as be taking pictures with ease. Light and Easily Portable: The desk tripod stand is only 28 cm tall. It is easy to storage and travel comfort. 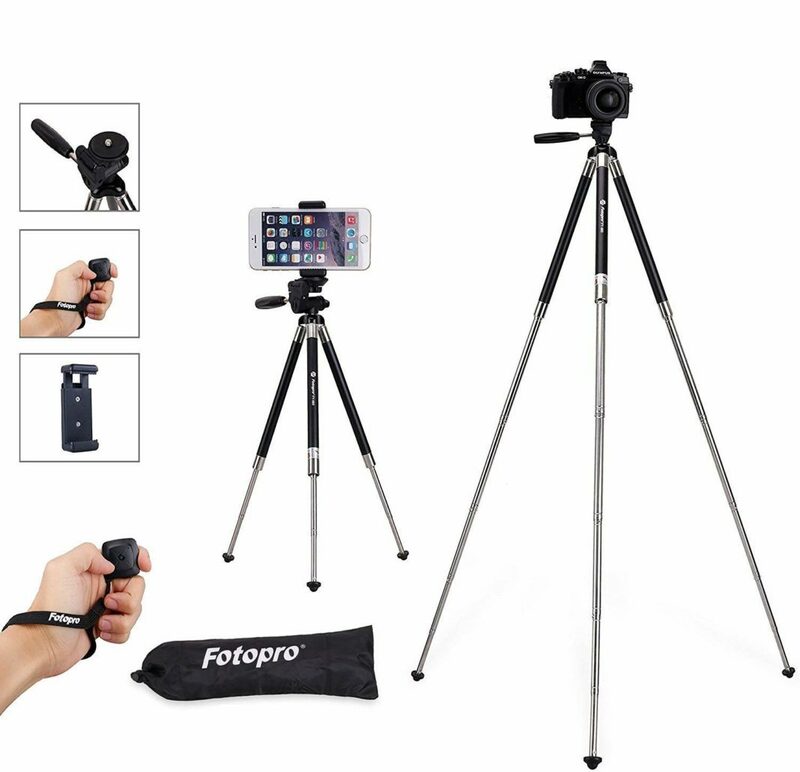 The adjustable and quick release phone mount grasps to your phone or camera sturdy and won't fall out, and the tripod stick is suitable for Android and iOS devices up to 3.5 inches and no need to download APP,It let's you start/stop recording videos as well as take pictures,You just switch from camera mode to video mode. Then press button to start and stop. The Arkon iPhone Mount is truly one of the best iPhone tripods on the market. This little travel accessory packs a punch. For an 11-inch tripod, there are so many features. 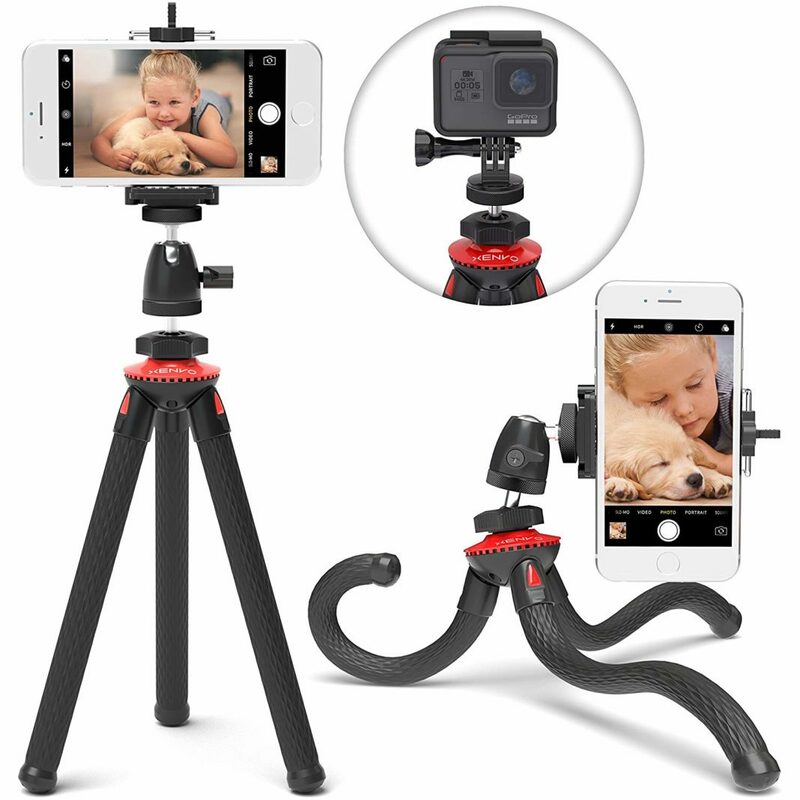 It includes a spring-loaded phone holder that expands to hold phones up to 4 inches wide; a bubble level that helps keep photos and live video from being crooked; 7-inch bendable legs with rubber non-slip feet; a quick-release button on the side of the tripod that detaches the mount plate for easy portability; and a tilt lever that provides additional flexibility in positioning the tripod to get the shot you need. Unleash your creativity with the Xenvo SquidGrip Tripod — The ultimate flexible smartphone tripod. Crafted with textured neo-rubber legs for superior gripping power so you can mount and secure your phone to just about anything. The SquidGrip Tripod is incredibly strong yet lightweight and compact making it the perfect companion for capturing photos and videos. Take the SquidGrip with you on your next adventure or use in right in your own backyard. The SquidGrip Tripod allows for infinite variety when positioning your phone for unique camera angles so you can capture impossible shots with ease. Superior Flexible Legs: Secure and mount your phone in any position imaginable. Wrap the textured gripping neo-rubber legs around a lamp, chair, tree or any object with rock-solid holding power to adjust your camera angle for the perfect shot every time! Portable and Durable Design: Take the SquidGrip smartphone tripod anywhere you go. You'll be amazed at the lightweight and compact design that packs a punch with unshakable strength and stability. The perfect companion for smartphones and GoPro action cams. No other flexible phone tripod can match the SquidGrip's unparalleled strength. Universal Compatibility: The included SuperGrip phone mount adjusts to hold ANY size cell phone. Get the ultimate mobile phone tripod for iPhone X, 8, 8 Plus, 7, 7 Plus, 6, 6 Plus, 5, 4, Samsung Galaxy S9, S9 Plus, S8, S8 Plus, S7, S7 Edge, S6, S6 Edge, ALL Samsung Note models or any other smartphone. Infinitely Adjustable: The included Ball Head 360 allows for endless possibilities when positioning your phone. Capture photo or video from any camera angle. The all metal construction ball-head even allows for 90 degree bird's eye shots so you can angle your phone perpendicular to the floor. Great for product and food photography or anywhere your imagination takes you. Lifetime Warranty: If your SquidGrip professional heavy duty tripod breaks or fails, or you're not 100% happy, they’ll replace it or refund it, no questions asked. Taking better pictures has never been more simple. Now, you can get the effortless looking vacation photos you want. Skip out on the selfies or asking people to take your pic. Style your photos the way you want to. The best iPhone tripods make it easy. Looking for more tips, tricks, and know-how on photo and video taking? Check out these articles below. Related Article: Travelers, Are You Looking For The Best Camera For Vlogging?